This winter I’ve worked part-time for the Northeast Farming Association of NY, which includes handling technical assistance requests from farmers about organic vegetable production. Most of these are pretty straight forward—helping read a soil test, suggesting places to source organic seeds, or brainstorming pest control options. Others hit me in the gut—like the growing numbers of dairy farmers wanting to learn about vegetable production after this year’s low milk prices forced them to sell off their cows. Yup, this is one of my more downer blogs, but I’m writing it because I think it’s important to think about money in agriculture and where our food dollars go. Despite the price of milk seeming high from the consumer end, those dollars don’t trickle all the way down to the farm. This has been rattling around in my head since December’s Guardian article on increased farmer suicides (https://www.theguardian.com/us-news/2017/dec/06/why-are-americas-farmers-killing-themselves-in-record-numbers) caught a lot of press in the agricultural world as it captured some of the stress that farmers, especially commodity farmers, are facing, and was reinforced by a more local story about NY dairies receiving information about suicide prevention from their coop last month WITH their milk checks (http://www.watertowndailytimes.com/news03/dairy-cooperative-sends-out-letter-with-suicide-lifeline-and-other-contacts-20180212&&) which was then picked up nationally by NPR (https://www.npr.org/2018/02/27/586586267/as-milk-prices-decline-worries-about-dairy-farmer-suicides-rise). The US is amazingly blessed with good land. We can feed the world a few times over, but we struggle mightily to chart a farm policy that keeps Americans fed, our farms and environment intact, and lets us all enjoy the healthy bounty of good crops raised well. Instead we’ve taken the tack of commoditizing our food, of raising vast quantities of what we can grow the cheapest (corn, soy, grain), and then processing them into nutritional oblivion. At the same time, we incentivize and reward farms to get bigger and bigger and run on razor thin profit margins so that one disastrous year or a hiccup in the market can flatten even the best producers. The most frustrating thing with the US cheap food policy is that it has warped agricultural markets and depressed rural economies for decades, but food *still* doesn’t feel cheap to us as consumers because food purchases now vie with all the new expenses in our lives (internet access, cell phone plans, and rising health care costs eat up anything households save on food) and our darn salaries haven’t risen with inflation. According to the World Economic Forum, the US is one of only eight countries that spend less than 10% of household income on food and by percentage spends the least of any county (We’re number one?). From a consumer standpoint, this isn’t necessarily bad, but for the farmers whose life lies in the margins of a few cents more per pound of grain or milk, that’s a brutally low percentage. 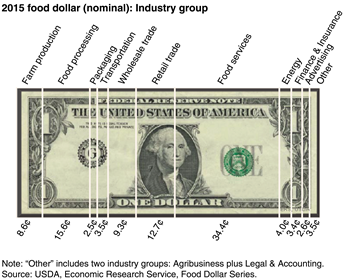 Yup, 8.6 cents on the food dollar going into food production, with only 15.8 cents overall reaching farmers and the remaining 84.2 cents going to marketing. So as inflation hacks away at consumer salaries and the input costs of farming surge higher each year, the actual bit of the average food dollar getting back to the farms is less than two dimes. And it’s this situation that has suicide prevention resources going out with milk checks and me answering calls from farmers that feel the weight of the generations before them as they face losing their farm. Do you want one more depressing graph? This one is what I find most challenging as a household with two full time farmers. Farming households look economically sound on paper, bringing in a median household income above the national average. 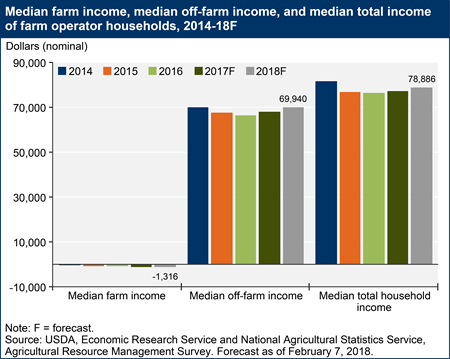 Yet median *FARM* income, the income derived from agricultural activities, is negative, which means there are a lot of American farm families spinning their wheels as fast as they can working all day farming, yet not actually earning any income from that labor! It makes me wonder how many executives at dairy or food processing operations work full time for free? Beyond helping struggling farmers at NOFA-NY this winter, I also worked on projects that address more vegetable related production challenges. With the proliferation of new technology and growing numbers of farmers markets, grocery deliver services, and CSA-like aggregators, non-dairy farmers are facing looming financial challenges as well as their costs of farm inputs and labor keep shooting up, as retail and wholesale market prices plummet. Even vegetable farmers like us with more flexible marketing options than dairy producers are pinched, with many now selling the same crops they used to sell retail at wholesale pricing that doesn’t cover increased costs of production. In 2004, my take home pay from farming full-time was 35 cents on the dollar. In 2017, it was 9 cents, despite thirteen years of hugely improved production and efficiency. Farming is one of those careers where it’s not so easy to walk away or make big changes, especially for established dairy operations. Current milk (and produce) prices usually cover costs of production but are hard to stretch over to capitalize new projects, and farm loans and mortgages are variable by the month, so as interest rates rise, producers will struggle to keep up with debt payments they have rather than be able to take on new debt to change gears. It’s also hard for long time farmers to conceive of not farming—how do you walk away from the barn where you’ve spent every day of your life milking in, just like the generations before you? It’s clear there are no easy answers here—the world is changing and farms have to adapt. My concern as a farmer, a food-eater, and someone who loves our state and our local community, is how do we navigate through this transition without losing the things that are important to us, our community, and our environment? When I look at the ongoing “cheap” food policy where so little of the money spent on food reaches the real producers, I see it buying us an emptying rural landscape with fewer rural jobs and fields that are easier to fill with houses and developments, where we don’t get the chance to have the connection with the food that we eat and the farms that feed us. Yet this question of a broken food system is way beyond the scope of any easy fixes. So to move off my downer note, what *can* we all do? One way to start is buying more locally—search out your farmers and buy directly from them so your purchases go to cover costs of production rather than corporate marketing. Local farms are vitally important for ecosystem services (all this open land helps trap carbon, filter water, and provides habitat way better than houses or roads do). Local food is also super fresh—it’s hitting your plate at its peak taste levels rather than getting shipped across the country (or the world). Supporting your local farms and farmers is also fun. Just in our town alone, there are farm festivals, farm tours, U-Pick gardens, concerts, great weekly markets, local food stores, a ton of CSAs, and even dairies selling milk directly to customers. Beyond buying local and connecting with your farming neighbors, there are also organizations (and some politics) that you might want to pay attention to. On the political side, the Farm Bill is on the docket for this year (hopefully, though it’s not guaranteed given how Washington is recently). The farm bill is a behemoth piece of legislation that bundles a lot of social service programs with farm funding that reaches across the country. It’s certainly not a perfect bill but is vitally important to supporting farmers and food systems. In NY, we have an invaluable organization called Farm Net (www.nyfarmnet.org), funded largely through tax dollars, and you can encourage your representatives to continue supporting its funding. Farm Net utilizes a network of professionals and volunteers to provide free, confidential assistance to farmers going through difficult times and is a much-needed resource right now. Finally, you can connect with and support local and national farm organizations, with Farm Aid being a good start to finding groups that help farmers (and I of course love NOFA-NY). And what we are doing as farmers in our small corner of the country? Well first of all, we are keeping on keeping on. We are passionate about growing food for our neighbors and community, and don’t see this fading. From our farming perspective, with it being increasingly hard for farmers of all scales these past years, and the prognosis not great for many of our larger neighbors, it’s reinforced to us why we want to stay as a small farm and sell our food directly in our community. 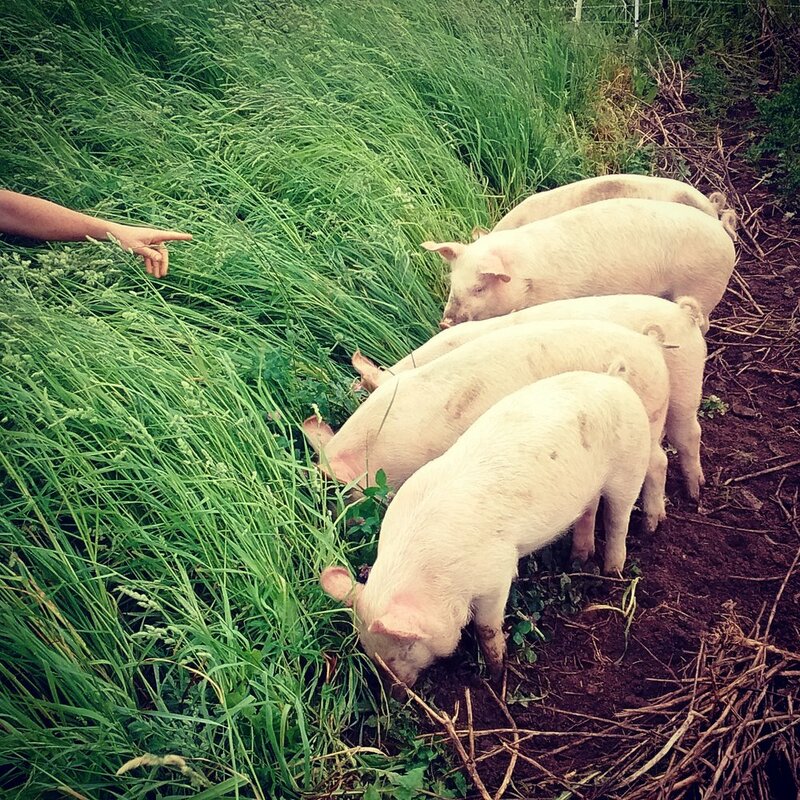 We want to know our customers, help folks enjoy and have fun with delicious, local produce, and open up our fields and farm so that you can see how we grow and connect with nature and the joy of growing things. Being able to sell more locally means we can save money on transportation and marketing and logistics, and we don’t need to sell our product to wholesalers for less than what it costs us to grow it. It also means we can focus on what our customers and CSA members want us to grow—good, healthy food for the community that tastes great. Finally, we are buying local as much as we can as well, to help support our neighbors as well. We hope you have a great rest of the winter—go explore your local farms and drink lots of milk from local farms and co-ops! Because all serious blogs need to end with a puppy!